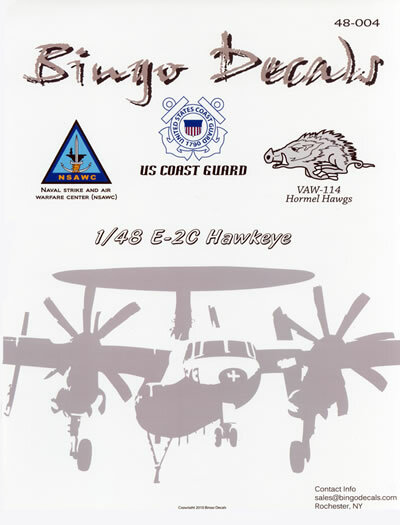 48-004 is the fourth release in Bingo Decals’ six-sheet coverage of the Grumman E-2 Hawkeye in US Navy service. 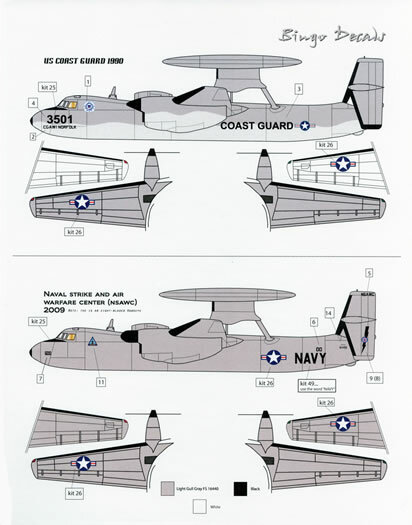 The sheet provides markings for three different machines, one each for the United States Coast Guard, the Naval Strike and Air Warfare Centre (NSAWC) and VAW-114 Hormel Hawgs. Modex 3501, Bureau number 160698 assigned to United States Coast Guard. This machine was one of nine that were transferred to the Coast Guard in the mid-1980s and used for maritime interdiction operations. It caught fire and crashed short of runway at Roosevelt Roads, Puerto Rico Aug 24, 1990 killing all four crew members onboard. Camouflage scheme is light gull grey upper surfaces over gloss white undersides. Modex 600, Bureau number 1644925 of NASCW in 2009. In overall glossy light gull grey. Note that this option is fitted with the new eight-bladed all-composite Hamilton Sundstrand propellers whilst the other two options are fitted with the four-bladed Hamilton Sundstrand 54460-model electro-mechanical, steel-spar propellers – see the note at the foot of the page for your options in 1/48 scale). Modex 601 Bureau number 163693 of VAW-114 Hormel Hawgs (Disestablished in February 1995) CVW-15 embarked aboard the USS Kitty Hawk circa 1978. This option is in light gull grey upper surfaces over glossy white undersides. Supporting information/guide to decal placement comes via two A-4 sized sheets that show full-colour drawings of each option. The drawings consist of left hand side profiles of each option as well upper and lower scrap views of the upper and lower surfaces of the wings, and an oblique view of the left hand side of the nose. Simple paint scheme information is provided too. The decals themselves have been printed by Microscale Industries and are absolutely superb. They are thinly printed with a minimum of carrier film surrounding each design and all are in are in perfect register. You are only given squadron markings and serials as well as a pair of out of size national insignia for the Coast Guard option. 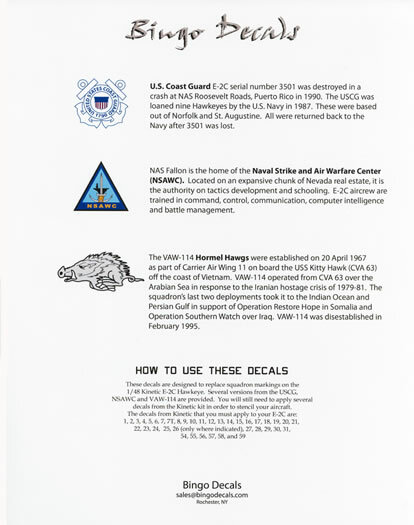 The placement guides tell you to apply the Kinetic E-2 kit decals for the rest (the stencil data as well as the national insignia) and they have provided the individual decal numbers from the kit’s sheet to assist you here. For those who don’t have the Kinetic kit its decals are very comprehensive indeed as well as being of excellent quality (produced by Cartograf). An excellent sheet from Bingo Decals. 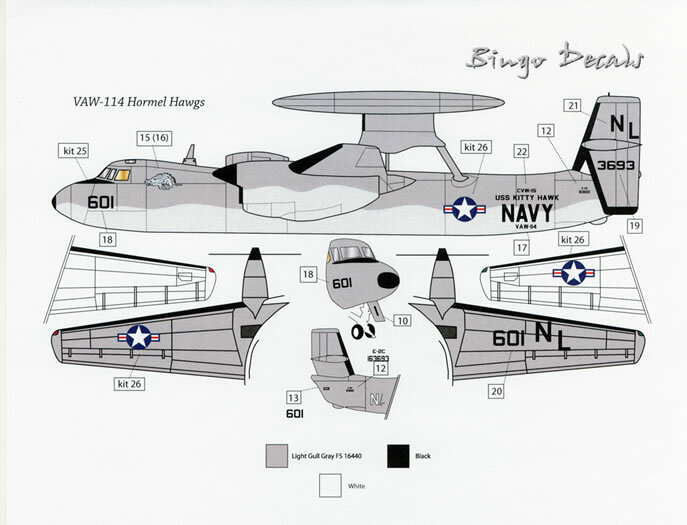 As well as the VAW-114 option it provides you with markings for two lesser known operators of the E-2.